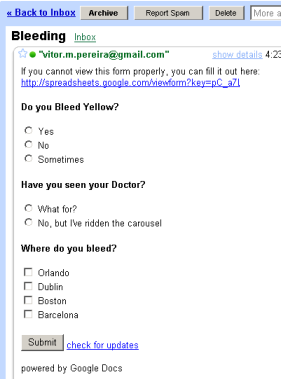 "Create a form and invite people to fill it out. They won't need to sign in, and they can respond directly from the email message or from an automatically generated web page. Answers will be automatically added to your spreadsheet." Among a few other improvements like saving presentations as PDF, Google added the possibility to share a spreadsheet as a form. This is a great way to gather input from people and automagically have it inserted in a spreadsheet. Nice and easy like they usually do it.